The Road Safety Authority said it will be watching the UK’s road laws with interest. THE ROAD SAFETY Authority (RSA) is considering linking speeding fines to drivers’ salaries. New proposals, which are at the “early stages” of discussion, would see fines issued on the basis of the driver’s income and not a flat fee across the board as is currently the case. Similar measures have been rolled out in the UK this week and the RSA confirmed that it would be watching with interest how the measures affect driving practices. It’s at its very early stages yet. I can confirm that we won’t be submitting anything (to the Department of Transport) in the short-term / coming weeks. We are monitoring the situation in the UK and will consider our proposals after that. 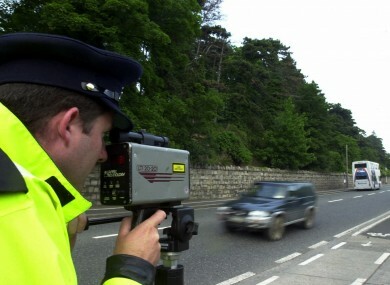 AA spokesman Conor Faughnan said that the potential new fines could be a good idea to stop repeat speeding offenders. However, he stressed that he would prefer to see Ireland’s current road laws “adequately enforced”. He said: “You can see potential in it. If you look at road safety laws here, we have a suite of laws which are among the toughest in the world. The problem is that we don’t adequately enforce laws nationwide. Currently, those who are clocked driving over the speed limit are fined €80 and given three penalty points. Those who are seen to be driving a considerable amount over the limit can be brought to court. In the UK, drivers can be fined 150% of their weekly salary under new rules. The measures, brought in on Monday, mean fines for speeding motorists will have a starting point of 150% of weekly income. This would apply to those who, for example, go at 41mph or more where there is a 20mph limit, 51mph or more where there is a 30mph limit or over 101mph on a motorway. Sentence levels for less serious offences are not changing. The maximum fine for speeding in the UK is £1000, unless it takes place on a motorway, in which case it is £2500. The Department of Transport has said it is currently reviewing its road safety strategy. A spokesman said: “The Department is currently giving consideration, with the RSA, to including an action in the mid-term review of the Road Safety Strategy 2013-2020 to deal specifically with speeding. That action may include reference to graduated penalties for speeding and the appropriate court penalties for same up to and including disqualification. However, the specifics of the Action itself and the wording to be included in the Action have yet to be discussed and agreed with the key stakeholders. Finland already uses a system linked to pay. In 2002, a director of phone company Nokia was ordered to pay €116,000 after being caught breaking the speed limit on his Harley Davidson. Email “Those who earn more will pay higher speeding fines under proposed safety law changes”. Feedback on “Those who earn more will pay higher speeding fines under proposed safety law changes”.